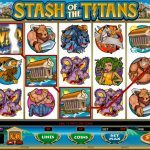 Stash of the Titans is a video slot game from Microgaming that takes us on an adventurous journey to mount Olympus to meet the Gods and Goddesses of Ancient Greece. Is that exciting or not? The cartoon like symbols represent famous characters of Greek mythology. You do not have to be history buff to like this fun, entertaining slot though. This seems like a new twist to a theme that is one of the most popular in the Online Casino Industry. Stash of the Titans is powered with only one special feature, even though at first look we thought that there are more. Anyhow, free spins is all you get when you play this game and you will see for yourself that that is enough. Let’s start with special symbols first. We have a wild in Stash of the Titans and it is the game’s logo symbol. The wild stands in for every other symbol except for the scatter to complete a winning combination. The scatter on the other hand is Medusa, and it is the key to the free spins feature. 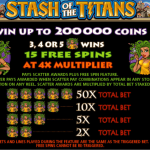 For landing 3 or more scatter symbols you will receive 15 free spins with all wins quadrupled. The bad thing only is that the feature cannot be re-triggered. 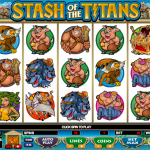 Stash of the Titans, like any other game from Microgaming, has many qualities that we are looking for in an online slot. It is entertaining and it is easy to play. Theme wisely we love this slot, because it is such a refreshment. Microgaming took a theme that is widely popular and presented it in different way. And this is what they do the best, when it comes to online slots, and make them irreplaceable. The next one is one of our all time favorites! consider playing Fat Lady Sings a 5 reel slot by MicroGaming.